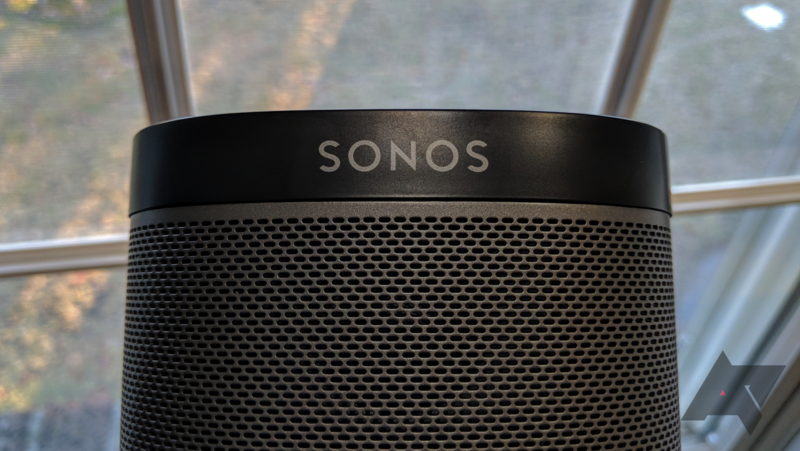 Sonos products are praised for a lot of good reasons, but integration with other smart home ecosystems isn't one of them. 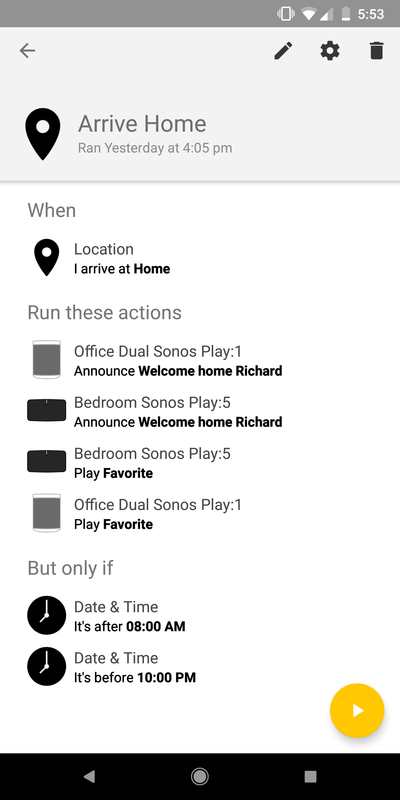 Until recently, you'd have had to use some separate hardware or scripts to control any Sonos speaker, but no longer. Google has added support for Yonomi to the Google Home and Google Assistant, and since Yonomi supports Sonos natively, that means that controlling your Sonos speakers with Google Home no longer requires a workaround. Yonomi only announced this new Google integration a few days ago, so this is still a very recent change. 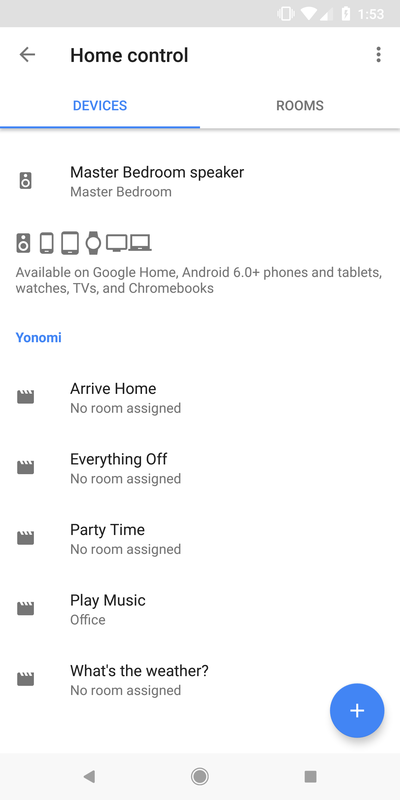 Rita actually spotted Yonomi as a new entry in Google's Home Control page even before then, too. 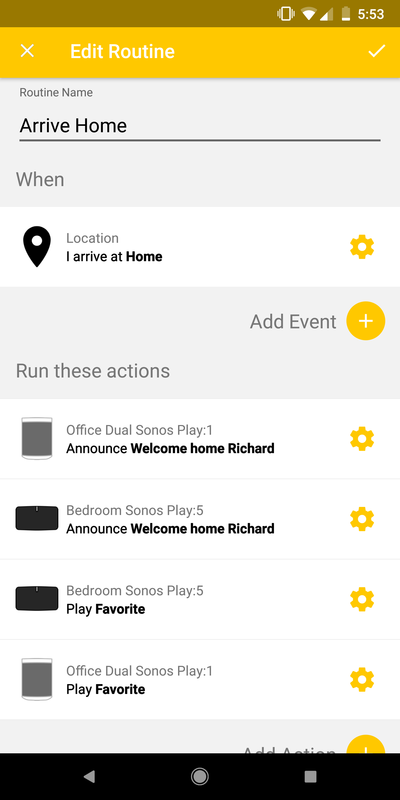 But even though this is new territory, Yonomi is well-aware of the fact that Sonos integration is something that smart home users have been waiting for, with multiple mentions of Sonos speakers in its blog post. Luckily, even for a relative smart home noob like myself, it's pretty easy to set up. Why does this matter, you ask? 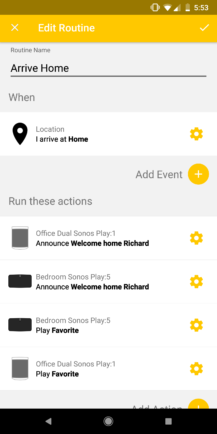 To get similar functionality previously, you had to purchase extra hardware like Samsung's SmartThings or Logitech's Harmony, use strange scripts like Tasker and IFTTT, or use hacky workarounds like Home Assistant. Yonomi provides a solution that requires no extra hardware, a relatively easy-to-use UI, and it's absolutely free. Plus, you don't have to talk to a second Google Assistant voice or say "ask x to do y," as this is native support. In short, it makes things a lot easier. To set this up, start by downloading the Yonomi app from the Play Store. Once it's installed, login or create an account. 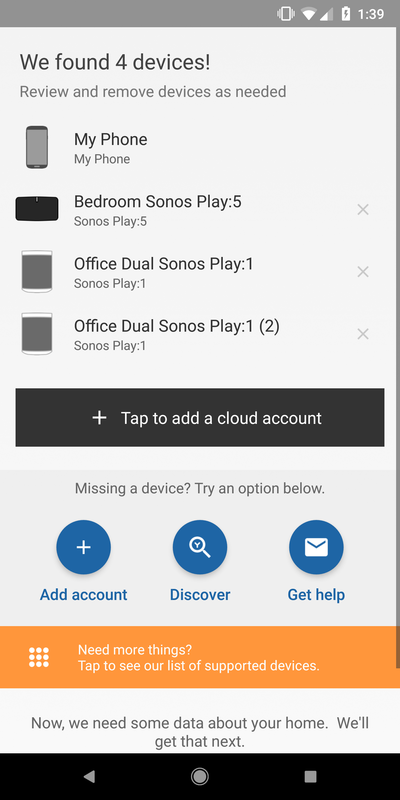 If your phone is on the same Wi-Fi network as your Sonos speakers, they should automatically pop up in the app at this point. 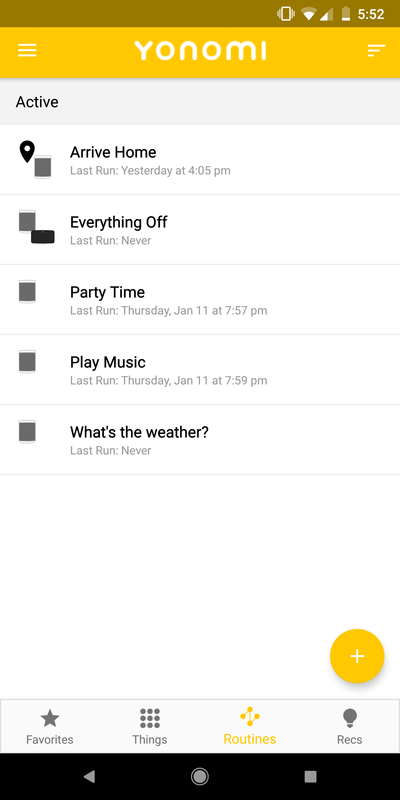 If they haven't, you can try manually adding devices by opening the hamburger menu and tapping 'Find New Devices.' 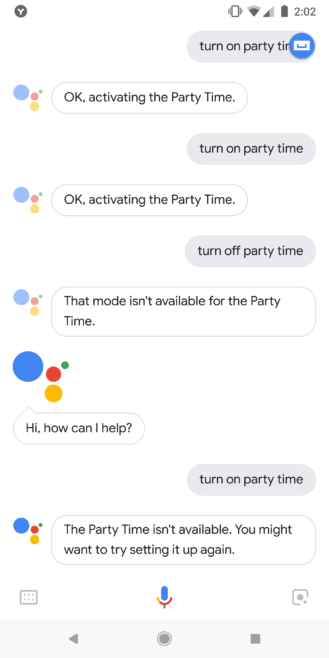 After this, head over to your Google Home app and link your Yonomi account to your Google Assistant (hamburger menu > Home Control > Add devices). 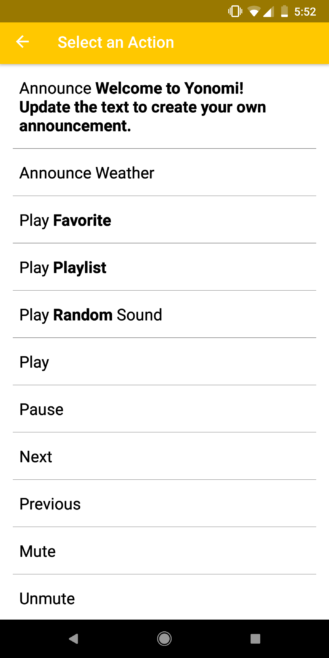 By default, the app should have five routines waiting for you: 'Arrive Home,' 'Everything Off,' 'Party Time,' 'Play Music,' and 'What's the weather?' It's up to you to fumble around with what you want each command to do, but the presets give a nice demo. For instance, 'Arrive Home' will detect via GPS when you get home, at which point it'll automatically announce "Welcome home, *insert your name here*" through your speakers, begin playing your preferred music after that, but only at certain time ranges. Everything is configurable, as you'd expect it to be, and it doesn't take long to catch on. left: Confusion. right: Things you can do with Yonomi. Now, this solution isn't perfect. There doesn't seem to be a way to play specific songs without creating a new routine for each individual song in your 'My Sonos' library, though you can have your Sonos play certain playlists, as well as announce the weather and phrases you enter. Additionally, you can't say "Turn off routine name"; you'll have to set up a whole new routine to turn it off. That's not a huge deal, though, as you can set one routine to just pause music. These aren't huge nitpicks in the grand scheme of things, but they're worth noting. All things considered, it's just nice to finally have native integration between Google and Sonos. If you'd like to check this out, don't hesitate to download Yonomi from the widget below. It can do other smart home-y things, too.